The way basements are constructed makes them vulnerable to water intrusion and leaks. Water ideally flows down through loose soil near the foundation and away from the basement. When drainage fails or soils shift and settle, water pressure increases against the foundation, increasing the potential for leaks. What causes water to leak into a basement? It’s easy to blame a wet basement on mistakes made during a home’s construction process, but this is rarely the case. The truth is that even a well-constructed basement foundation can still end up with a water problem. Taking a closer look at how a typical basement foundation is built, we can identify several steps that introduce an opportunity for future basement water problems. Takeaway: The soil closest to your foundation is more absorbent and permeable. 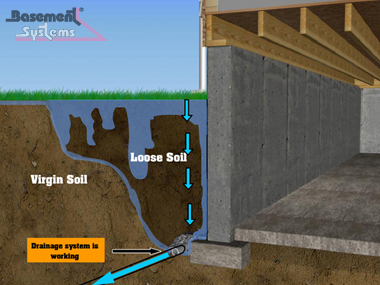 An exterior foundation drain is often installed to provide an escape route for groundwater. Unfortunately, these drains can fail, such as when a section of the drain line is crushed during the backfilling process. Even when properly installed, an exterior drain line will eventually clog up with silt or become obstructed by growing roots. When the exterior drainage system fails, water pressure, referred to as hydrostatic pressure, can build up against the foundation. Takeaway: Drainage is often improperly designed and installed and eventually clogs and fails. Water under pressure follows the path of least resistance, seeking out cracks, gaps, and openings. In a basement, the crack between the basement’s slab floor and the foundation wall is an open invitation for water to intrude. This gap is intentionally designed to act as a control joint to prevent cracks from forming in the center of the floor. For this reason, the concrete floor is poured in a separate process after the basement walls are built. Takeaway: Water will find every opportunity to seep, leak (and sometimes gush) into a basement.